Stress is both an angel and a demon: On the one hand, it pushes us forward to adapt, achieve and strengthen muscles, and on the other hand it can kill us prematurely. How does stress shape the body and how can we manage it for optimal health? If your horse is acting up and easily spooked, if their body is bracing or they are experiencing pain or hoof sensitivity, chances are they are magnesium deficient and would benefit greatly from a great natural horse calmer – magnesium chloride salt flakes. Food grade natural magnesium chloride salt flakes can easily be incorporated into their feeds every day to help prevent magnesium deficiency. A vital key to making sure that stresses are beneficial and not detrimental is to maintain an appropriate balance between tension and relaxation. If you keep pushing and stressing muscles, ligaments and joints without appropriate recovery time they can get injured and inflamed. It can lead to Repetitive Stress Injury, acidification and tissue breakdown, as detoxification pathways start to fail. Dietary magnesium supplementation is a great way to enhance recovery after stress by stimulating detoxification enzymes and protein synthesis to re-build tissue cells. When animals are tensed and in the ‘fight or flight’ mode it is called the ‘sympathetic mode’. This is when the blood rushes to extremities ready for quick-twitch muscle firing to escape danger or to fight the predator. During this phase the digestive system stops, as does the cellular detox and cell-building systems. When the danger is gone, relaxation follows as the ‘parasympathetic mode’ (sometimes called grazing or ‘rest and digest’ mode) – where digestion and the other systems return to normal. 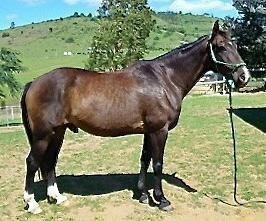 If a horse is constantly in a stressed sympathetic mode the body cannot adequately digest foods and extract nutrients. Stress itself causes a more rapid excretion of magnesium. If soils are magnesium-depleted it is a double-whammy to accelerate magnesium deficiency. Magnesium chloride attracts water which helps hold it inside the cell in the structure of the cytoplasm. Magnesium and water keeps us younger, more flexible and ‘juicier’ longer! It is also essential for cell membrane integrity and electrolyte charge. If magnesium drops too low the cell wall depolarises (drops in charge) and therefore becomes looser, allowing escape of valuable hydration and potassium ions. The loss of magnesium and hydration is what leads to the crumpling and squeezing effect of the cramp, as calcium then moves in to contract the muscle fibres. Yes, we do need the calcium to contract, but magnesium performs the relaxation via its control of the calcium channels. With chronic magnesium deficiency over time, muscles, ligaments and joints get stiffer and more calcified – or older, harder and crunchier faster! Take care to make sure the diet is correctly balanced without overload of calcium and including sufficient magnesium. As magnesium gets too low, calcium becomes a tough bully and suppresses the work of magnesium. Both horses and humans alike are much more likely to be magnesium-deficient than calcium-deficient these days. Pasture grasses after a lot of rain tend to be very lush, but with the magnesium washed away from surface soils, the ratio of sugars in the grasses can get too high. A high calcium, high sugar and low magnesium diet leads to diabetes. 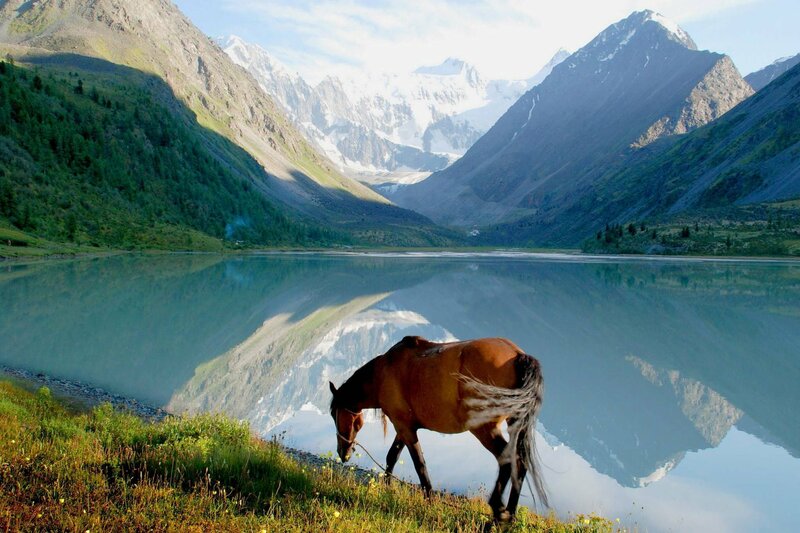 The evolution of the horse was from alpine regions with an abundance of magnesium chloride and trace minerals from glacial waters. The plant food they ate was high in minerals and low in sugars. These plant foods also carried an abundance of beneficial bacteria to assist digestion and produce essential fatty acids. Their natural diet was very nutrient-dense. As magnesium gets lower, sugar sensitivity, acidity and inflammation increases. As magnesium levels are increased in cells the sugar sensitivity and acidification settles down again. It’s like a see-saw effect. Magnesium calms the temperament as well as relaxes muscles. It helps cells detox and is vital in energy metabolism because it is used by the mitochondria to co-factor with ATP (adenosine triphosphate) – the energy currency of the cell. This bio-electrical system drives enzyme reactions in the body which are catalysts for all cell functions. Electrical energy is the life force, with magnesium at the crux of the energy process in all organisms. Magnesium is at the centre of the chlorophyll molecule and essential for photosynthesis in plants (conversion of light energy to stored starches). It is essential to help the haemoglobin carry oxygen in animal blood, so that low magnesium can also present as symptoms of anaemia and chronic fatigue. It takes 28 magnesium molecules to metabolise one sucrose molecule into energy, and 56 magnesium molecules to metabolise one fructose molecule. Consumption of sugars gobbles up a lot of magnesium in metabolism and can quickly lead to magnesium deficiency and dehydration. As you consume more sugar, which depletes magnesium, the electrical system starts to splutter and falter like an ill-tuned car engine. It also causes involuntary muscle spasms or hypertension as the smooth walls of the vascular system contract and increase pressure. The body starts to panic because of dehydration and extra adrenaline is released for action. Screaming for water and minerals as a result of the sugar assault and consequent acidification, the body desperately looks to re-establish pH balance. This state causes hyperactivity and over-excitation. The best way to help make a horse calmer and to return to equilibrium and relaxed ‘grazing mode’ is to supply adequate hydration and the right nutrition. As magnesium is low in soils it is recommended to add to food and water the most bio-available form of magnesium, which is the salt form called magnesium chloride hexahydrate (magnesium flakes). Make sure to use ‘food grade’ for oral use, as most magnesium chlorides are industrial grade with contaminants from agricultural or mining runoff, ocean pollutants or population waste sources. The food grade Mg salt flakes are usually from remote alpine regions, naturally dehydrated with the sodium skimmed off, and retaining about two percent other trace minerals. Food grade magnesium flakes should have an independent laboratory’s mineral analysis showing no mercury and no lead detected down to 10ppb. Ask the supplier if not sure. 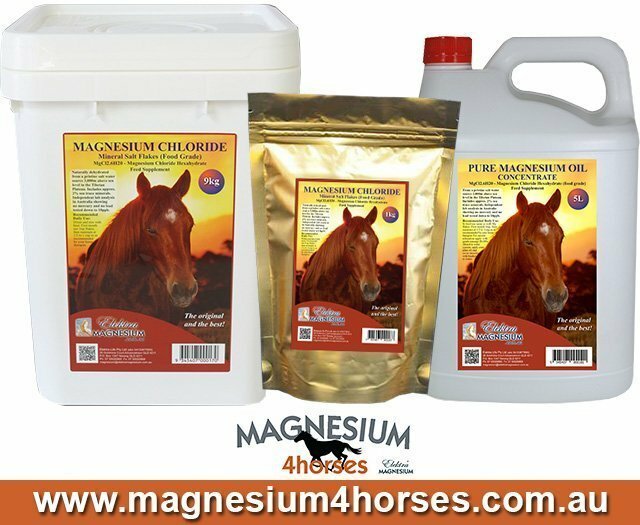 Not only is it more common for performance horses to suffer from stress and therefore lose excessive amounts of magnesium due to training and travelling, but the difference in improvement to performance with magnesium chloride supplementation is quite remarkable. Even race horses have demonstrated rapid improvement in muscle recovery during agistment between races. Magnesium helps collagen and elastin production. It helps to repair tissue and promotes flexibility and muscle strength. Dressage riders have also noted calmer and more controllable and focused horses when their magnesium needs are fully met.